I am currently in the 5th hour of a 9 hour layover, so I have decided to take this opportunity to write about the last destination of our Balkans road trip: Sarajevo. Sarajevo is the capital city of Bosnia and Herzegovina. The city is just as culturally rich as the rest of the country which makes the destination nothing less than remarkable. Like Mostar, the city was also heavily affected by the Bosnian War, and war-torn buildings are still found all throughout town. (During the war, Sarajevo underwent a siege which lasted nearly 4 years. This is the longest siege of a city in our modern era.) We spent a total of two days and two nights in the city, and we all agree that if it weren’t for the weekly flight we needed to catch back to Sweden, we would have gladly stayed in the city for a longer period of time. Since there were still many things left to explore after our two days in the city (and some of our adventures were rather spontaneous), this post will give you a bit of an eclectic list – not quite comprehensive – of things to see and do in Sarajevo. After visiting the gallery, we met a friend of a friend of a friend living in Sarajevo. He offered to spend the afternoon showing us around the city (would you believe me if I told you his name was Zlatan?). So, we spent the rest of the day trying local food, browsing through markets, and visiting other historical sights. 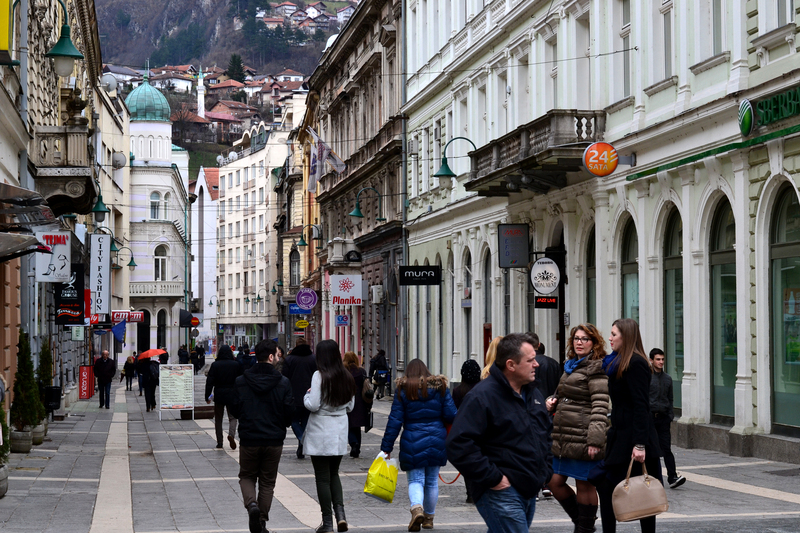 After all, Sarajevo already had an impressive history before 1992, and the city’s multiculturalism gives visitors many sights, sounds, smells, and tastes to experience. Please note that I was too hungry at the time to take a photo, so the pictures above have been borrowed from Electric Blue Food (I’ve got a fantastic blogger and photographer for a friend). 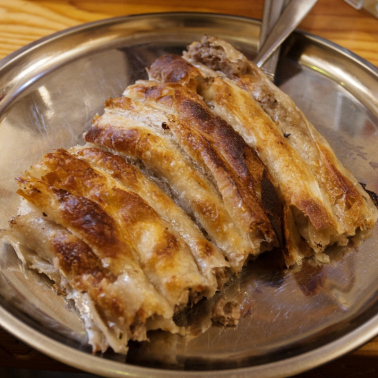 The first dish is a traditional burek which is a fried pastry filled with meat. Alternatively, you can eat a potato-filled one (I did). We ate the second dish, cevapcici, for dinner. They are pieces of fried, ground meat eaten with warm, soft pita and fried onion. Delicious. Even our vegetarian friend made an exception that day. 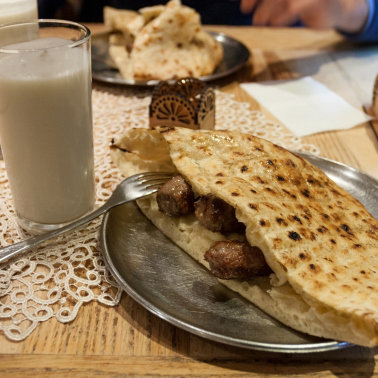 Overall, we found eating out in Sarajevo to be incredibly affordable. In the centre of town, you can easily have dinner for 4 for around 10-15 euros…total. 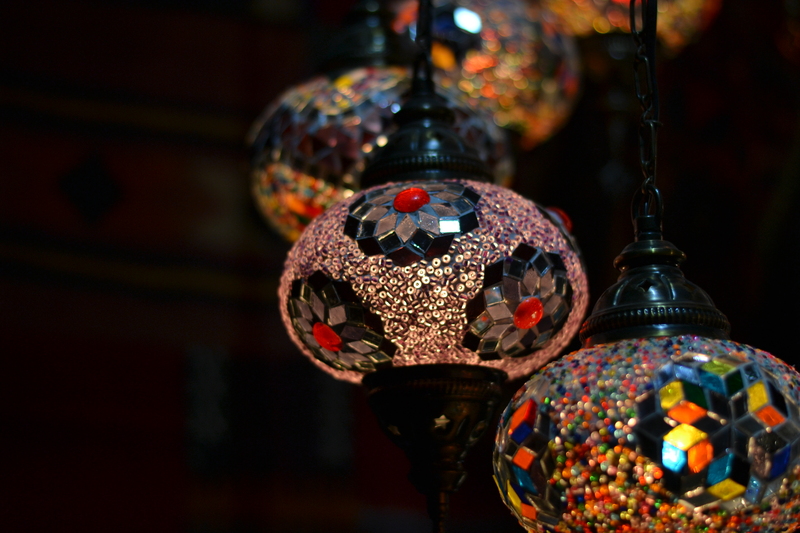 Since Bosnia and Herzegovina was once part of the Ottoman Empire, Turkish lanterns, silver teapots, and other Turkish souvenirs can be found and purchased all throughout town. I managed to come home with one of these beautiful lamps. The cultural diversity of the city, which can be seen through the variety of architecture, food, music, and market goods on nearly every street, is incredible. 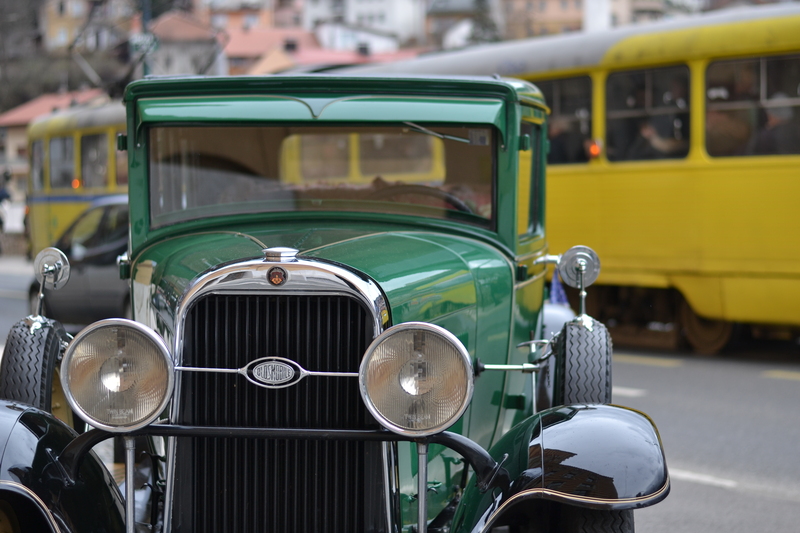 Take a look at the photos of the streets in downtown Sarajevo found earlier in the post. These streets – featuring very different architecture – are within 1 km of one another. 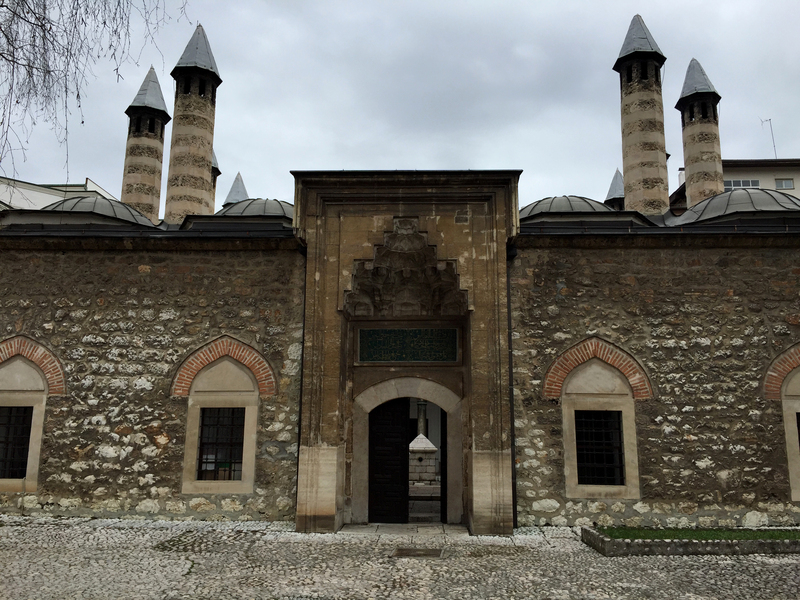 Mosques and other buildings created during the Ottoman rule can be found on the same street as more typical “central European-style” buildings which were built when Sarajevo was part of the Austro-Hungarian Empire. 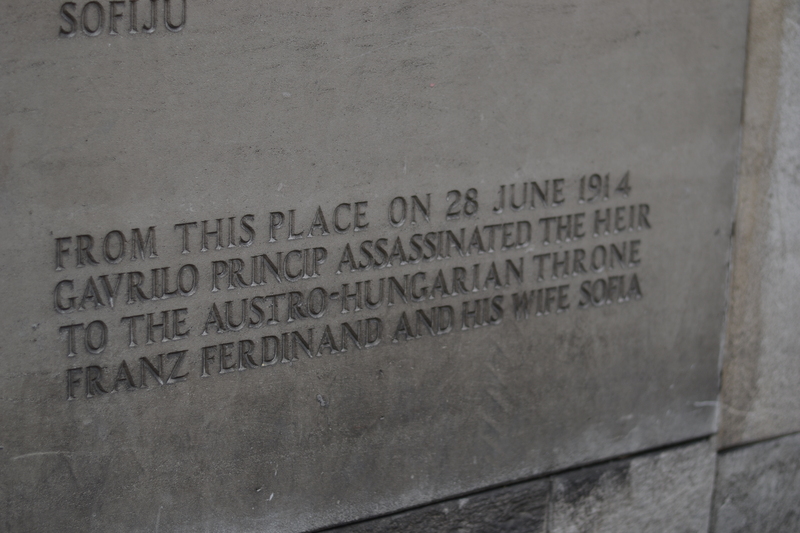 As the sign says, this is the spot from where the Austro-Hungarian Archduke, Franz Ferdinand, was assassinated. While tensions were already running high between many European in Nations in 1914, this act caused World War I to officially begin. 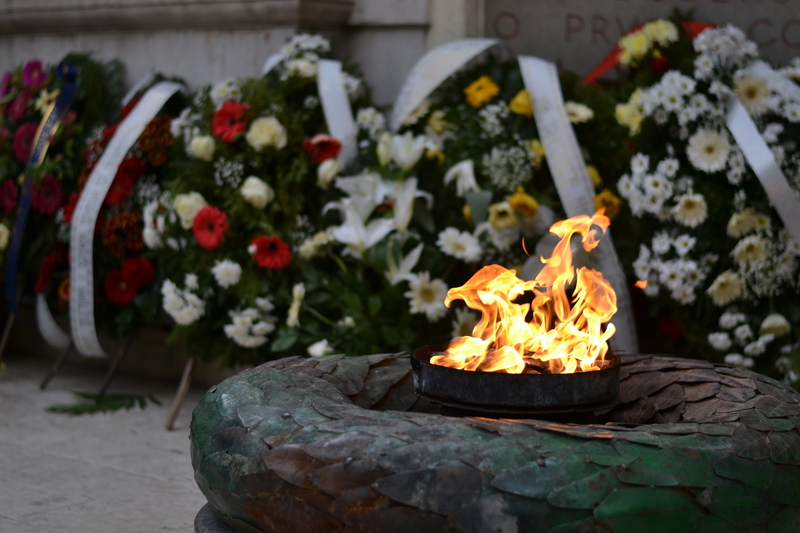 The Eternal Flame (above) is a memorial located in the centre of Sarajevo to commemorate the soldiers and civilians who lost their lives during the Second World War. The centre of Sarajevo is found in the bottom of a valley. However, many neighbourhoods have been built along the mountain sides facing the valley. During out last morning in Sarajevo, we drove our rental car up one of the mountain sides to an abandoned fort. We then carefully walked through the fort until we reached its ledge. The view was outstanding. If you looked to your left, you would only see grand, rocky mountains, a few homes here and there, and one winding highway disappearing into the distance – nothing to suggest the impressive and densely inhabited city that would appear as soon as you looked to your right. 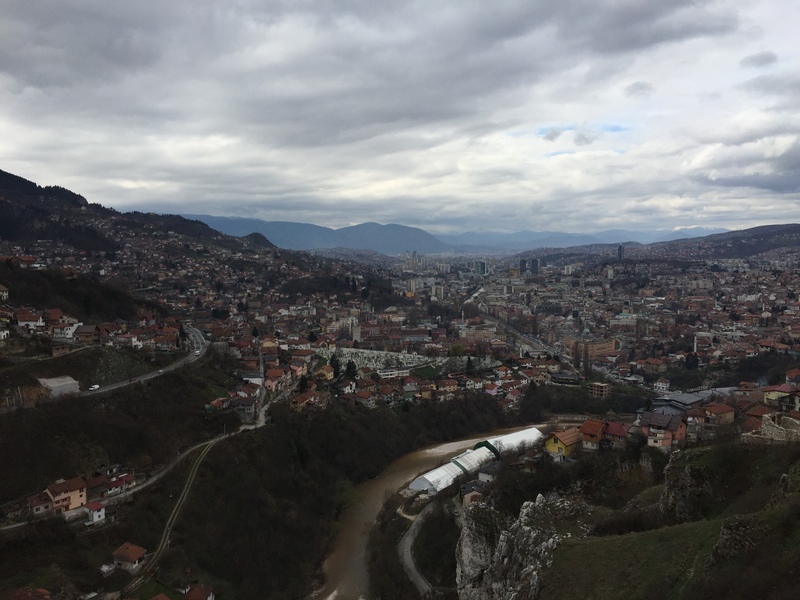 Panoramic view of Sarajevo from the abandoned fort. The patch of green filled with white tombstones in the centre of the photo is one of the many cemeteries created in town after the Bosnian War. Now, finally, here is a brief anecdote about driving in Sarajevo. During our last day in Sarajevo, we decided that we wanted to see the abandoned bobsleigh tracks from the 1984 Winter Olympics. Unfortunately, this didn’t come to pass, but our little misadventure has given me an invaluable travel tip to share about driving and roads in Sarajevo. Here it is: Don’t completely trust the driving route a car GPS or google maps gives you. Well, we programmed both the car GPS and Google Maps to guide us to the bobsleigh tracks. Sarajevo has many windy, steep, narrow roads and it seems that in recent years, many roads keep undergoing construction or deconstruction. Both navigation systems kept leading us to sudden dead ends where, for example, pathways that had once clearly been roads had become stairs. However, we found a solution. In order to actually reach the road that would take us to the tracks, we picked our own path based on connecting roads that had bus tops showing up on Google Maps. This way, we were confident that we would be able to drive on an actual road, since a bus must officially be able to drive through that road. And…Our strategy worked! So what stopped us from reaching the tracks? After reaching the final road – the road that was supposed to get us to the tracks (we even saw a hand painted sign saying we were on the right road) – the pavement suddenly ended and a steep gravel path began ascending uphill. With the fear of making our rented little hatchback “bottom up,” we had to call an end to our adventure there. I walked a few hundred meters uphill after the pavement ended and the gravel began. Yet, as I wrote right at the start of this post, I do hope to plan another adventure in Sarajevo soon. If you would like to read more about culture and history in Bosnia and Herzegovina, check out my posts about Mostar and Mostar’s streetart/architecture. Thank you! Sarajevo is an incredibly interesting city! Great post! We are heading to Bosnia and Herzegovina in just a few days! Now I have a few more ideas of what I want to explore while I’m there! Thanks for the comment! You’re going to have a really great time! It’s a beautiful country. I love Sarajevo, its a very special place, a little melancholic too. And that picture of the burek (I think thats the name of pastery with minced meat) made me remember the times I passed in Eastern Europe and that would be my fav street food! Great pictures and nice writing too. Thank you so much for the comment and compliment! And yes, that’s the burek. Definitely one of my favourite dishes from the region.